You may have heard the last name “Marcus” before. Bentzy and Shmuli Marcus of 8th Day lit up the Jewish Music world with their diverse styles and insightful lyrics. Currently however a new “Marcus” is making his way to the stage. Eli Marcus, brother of Bentzy and Shmuli, nephew of Avraham Fried, and cousin of Benny Friedman has just released his first album! This album is sure to separate him from the family as he creates a new name for himself with his own signature style. Lets get started on the review! Sheyiboneh – This album starts us off with a mixture of the classic sound we’ve heard on the older Piamenta albums sound mixed with some more contemporary elements. Being that Eli is a regular on the wedding scene I assume he must have tested out this song during the 2nd dance a number of times and gotten a great response. Rofeh Nemon – There is something refreshing about hearing this next track start immediately without any sort of introduction before the vocal is introduced to the listener. This song is powerful and gets right to the point from the start. David Hamelech – Time for the title track of the album! This track starts with a bang and keeps the excitement going throughout the song. The guitar solo towards the end is awesome! Kol Torah – The beginning of this next track reminds me a bit of “Aderaba”. Yossi Green seems to have a knack for composing not only songs that are masterpieces in and of themselves, but lyrical introductions that are sweet and a perfect fit for the vocalist they are being composed for. Mazal Tov – Although the majority of tracks on this album are composed by Yossi Green, this next track was composed by the one and only Yitzy Waldner. Yitzy throughout the years has composed many many treasures. He also seems to have a knack for composing great wedding themed songs. This track is no exception. Chavivi – While I don’t have anything too specific to point out about this track I will say that Eli outdoes himself vocally on every track I’ve heard so far. Nir Graf also outdoes himself playing bass on this track as well. Av Harachamim – For a slower song this next track has great movement especially the rhythm from the guitars and percussion throughout. Osiyos – This next track starts with a vintage “Piamenta” style intro and leads us into a very unique vintage styled arrangement. Eli’s vocals are performed with a lot of energy throughout the album and lend a lot of excitement to the quicker tracks. Look Inside – This next song composed by Elie Schwab sounds like something I can hear 8th Day performing. With another extremely unique arrangement and featuring some really cool whistling this song will have you tapping your feet along to the beat from the start. Keili Machzik – This next track features some really great piano parts played by Shai Bachar. I love how this song stays away from the typical “rock” arrangement and replaces the typical brass with some complimentary flute lines. Also featuring some really cool Yossi Green background vocals throughout the track. 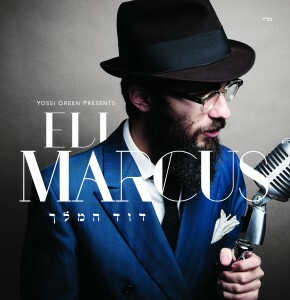 Yishtabach – In the spirit of keeping the vintage vibe of this album this next track starts the way you may have heard Elis’ album if he had released it a number of years ago. The song then opens up to a simple but gorgeous arrangement featuring a gorgeous grand piano and a kumzits style choir. While many artists prefer to end their albums with a “bang” this album ends for us on a nice relaxing note. To sum up my thoughts: Many times when a sibling or relative to someone within the Jewish Music world decided to pursue a musical career there is a lot of curiousness as to whether or not the sibling or relative is up to the task. In this case regardless of any family connections Eli shines vocally. Many can attest to his energy out on the Simcha-circuit as well. After listening to this album there is no doubt that Eli’s musical career will only grow from here on out. I am definitely looking forward to hearing more from Eli and after you purchase and listen through this album, you will too!